The Annunciation of Ustyug gained its name due to the legend that Saint Procopius of Ustyug predicted the fall of a meteorite and other calamities near the town of Veliky Ustyug. He tried to convince the citizens to confess their sins and pray for the city to be saved. They did not believe him and only at the last minute, when the storm had already started, escaped to the church and started to pray before the icon and were saved. 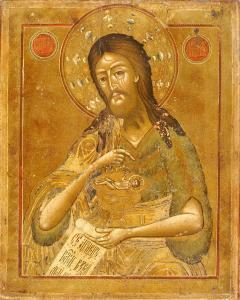 The icon depicts Christ Emmanuel standing In the womb of the Virgin, giving a blessing with his right hand. On the left – the archangel Gabriel, greets the Virgin Mary and is blessing her. At the top of the center, in a blue semi-circle of the sky with gold stars the Father is portrayed with a blue halo of glory. He sits on a red throne, at the foot of which are red cherubim, and above on the sides – red and gold Seraphim. The Father holds a scroll in his left hand, and His right hand blesses Mary. The Ustyug Annunciation in its iconography has its roots in Eastern Christian art. The point of this type of art is to explain the supernatural Conception – Incarnation of the deity. Therefore, in Russia, the Virgin with the Christ child depicted near her heart is sometimes called Our Lady of the Incarnation. “For you must know that the sublime work of the Incarnation was the work of the whole Trinity, although it was only the Person of the Son of God who became incarnate. It was as if one who put on a tunic were helped by two standing on either side of him who held the tunic in their hands….For although the Holy Trinity is every where, nevertheless you must think of It in your meditation as being here in a very special manner, by reason of the great and unique work which is being done.” St. Bonaventure, Meditations On The Life Of Christ, trans. 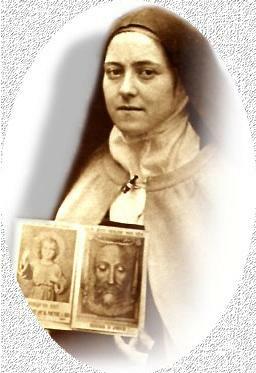 Sister M. Emmanuel, O.S.B. (St. Louis, MO: B. Herder Book Co., 1934), 16. Our Lady of Hope, is renowned for her beauty. The image is from the second half of the 16th century but later restorations (one by Castillo Lastrucci), added to it‘s beauty and unmistakable Sevillian style. The Virgin wears a green coat with sterling silver lining, highlighting her magnificent crown. 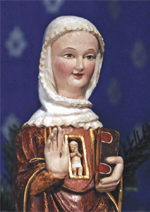 All year – except Advent – Mary holds the infant Jesus with her left hand and arm. 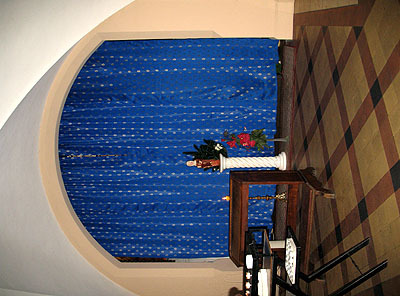 Below the statue (see above photos), in front of the basket appears an oval “O” iconographic detail of the Unborn Christ Child (reminiscent of the Advent “O” antiphons). 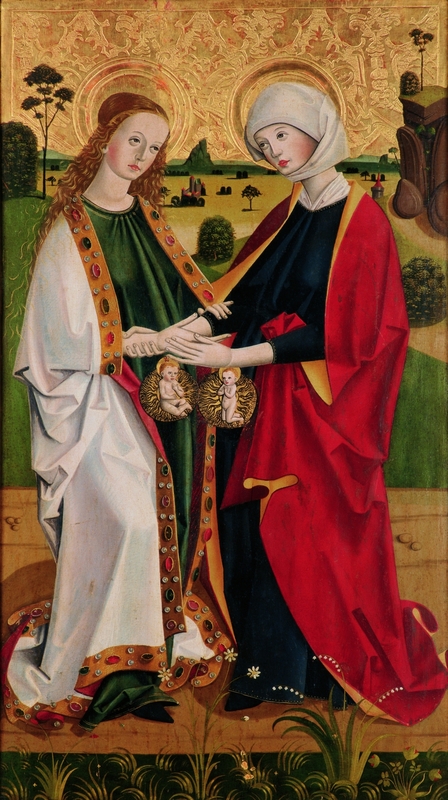 During Advent, the oval with the Unborn Christ is placed upon the Virgin, in front of her womb. 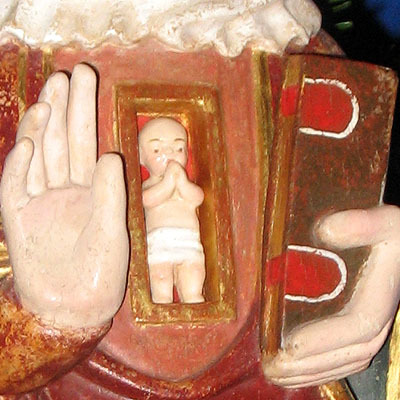 (The infant Jesus is taken down from Mary’s left hand during Advent and placed in an ornate casing.) See photos below. Then, on Christmas day the unborn Christ oval is returned to its place below the statue and the infant Jesus returned to Mary’s hand. These rituals give a unique charm to this statue and the Incarnation event. An Advent Tradition you may not have heard about. Over the last number of years, we have found over 100 images of Christ in Mary’s womb from around the world. Recently, we discovered that 2 of these images are part of an Advent Tradition that surprised us. The St. Phillip Neri Institute in Berlin has a wonderful statue that a friend of theirs carved for them. 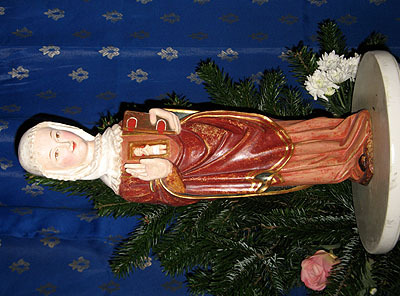 It is a copy of a miraculous statue of “Maria Gravida” that is in the Church of Maria Hilf Assumptio in Malta, Austria. This miraculous statue dates from around the 1400’s. 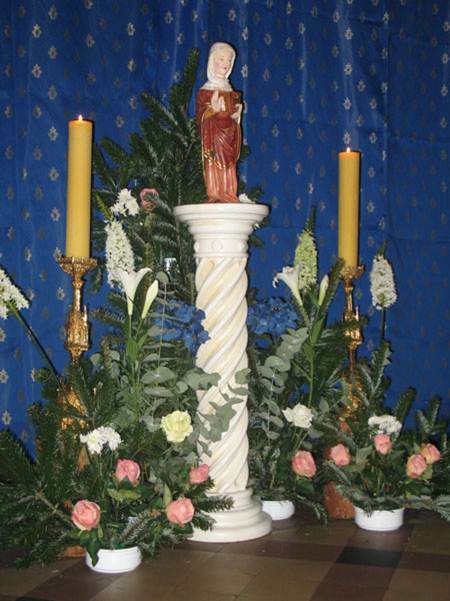 During Advent this Maria Gravida statue is placed on a pedestal in front of a blue curtain – behind the curtain is a Nativity scene. 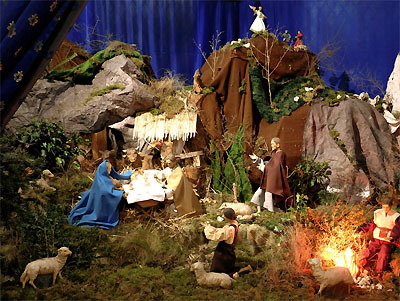 At Midnight on Christmas eve, the statue of Mary Pregnant is taken off the pedestal and the Nativity scene is unveiled. 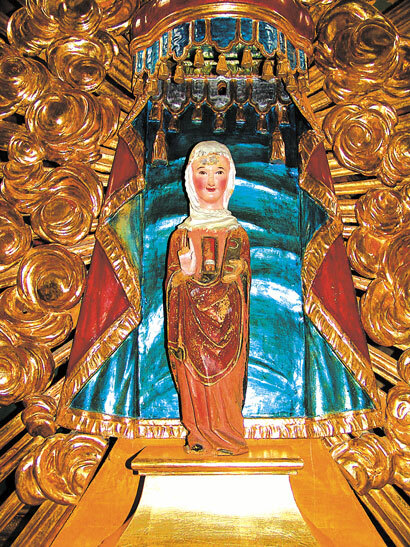 We have also discovered a similar tradition for the statue of Our Lady of Divine Hope in the Iglesia de San Martín Sevilla in Spain which we will highlight in a future post. “…. I wondered what name I would be given in Carmel. On several occasions Christ counseled us to have a childlike faith, even going so far as to placing a child in front of His disciples, so that His teaching would have the sacred and personal imprint of a living child. The personal devotions of holy Christians to the Christ Child have multiplied a hundredfold to engulf Catholic communities and cultures throughout the world. For the purposes of this discussion, we take it as a given fact that devotion to the Christ Child is tenderly woven into the devotional fabric of the Church, that it is to be encouraged (while being in conformity “to the doctrine, legal discipline and norms of the Church”) and that each individual Christian can enter into it with confidence. But why bother ourselves with a study of the Unborn Christ Child? John Paul II explains: “The conception and birth of Jesus Christ are in fact the greatest work accomplished by the Holy Spirit in the history of creation and salvation: the supreme grace – ‘the grace of union,’ source of every other grace, as St. Thomas explains.” The nine month continuum, from Christ’s conception to His birth, is an exceptional time of grace for the world and humanity – of utmost significance to the Church generally, and to expecting mothers and unborn babies particularly. After the dream (Mt. 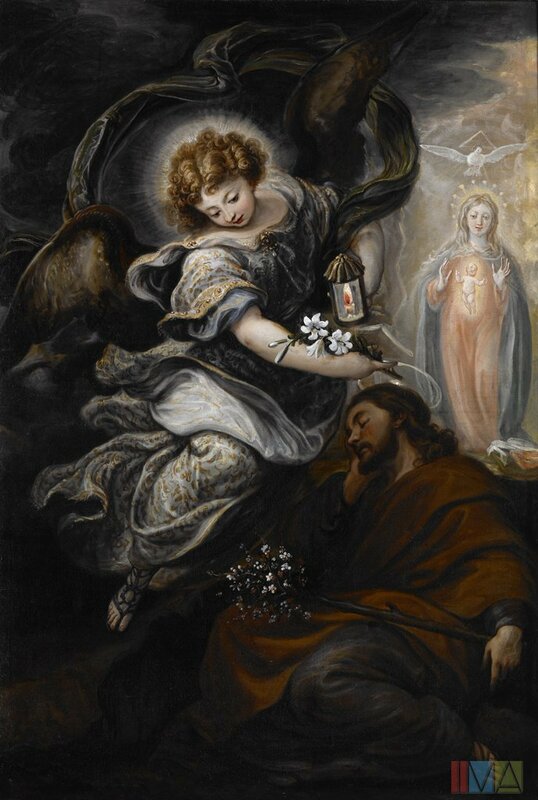 1:20-24) Joseph honored Unborn Jesus by welcoming Him and His mother into his home, by his obedience to the angel of the Lord, his doing God’s will, and especially by loving Unborn Jesus as his own Son (Mt 1:.24). 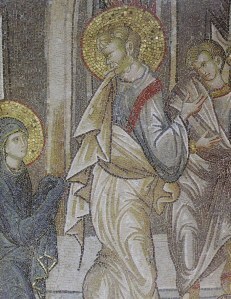 On this mosaic Joseph is depicted as taking the Virgin Mary to his home. This is one of the world famous mosaic depictions of Chora museum. It pleased God to bring the beauty of human adoption into the heart of the Incarnation mystery. St. Joseph is a model for all those in the pro-life movement. He took unborn Jesus and Mary into his heart and life. He took care of them, saved them from disgrace and even death, supported them and helped them find shelter. Father Faber talks about the grace Joseph received in this ministry – think of all of the graces you receive in your ministry to the unborn and their mothers. Mary honored Unborn Jesus by accepting wholeheartedly the Plan and invitation of God to be mother to the Messiah/Savior and by then loving Him (Lk 1:38). “In all these days, my gaze has necessarily focused on this depiction of the Annunciation of Mary (see above). What fascinated me is this: the Archangel Gabriel holds a scroll in his hand, which I believe is the symbol of Scripture, of the Word of God. And Mary is kneeling within the scroll; that is, she lives her whole life in the Word of God. It is as though she were steeped in the Word. Thus, all her thoughts, her will and her actions are imbued with and formed by the Word. Cardinal Berulle (1575-1629) – writing about Mary’s attitude in the hours and days after the Annunciation. We can imitate Mary in honoring Unborn Jesus by living his word and welcoming Him into our lives and by loving Him with our whole heart, mind and will. We also honor Unborn Jesus when we welcome unborn children into our world by our witness to their sacredness and by giving loving help to their mothers.